Compare the annual IKEA catalogs disbursed around the world and they are nearly identical, save for a slight difference. The difference is not in the Swedish translations of the furniture or the mock layouts of the numerous living rooms in the catalog. The discrepancy lies in the people who are portrayed in the company’s catalog enjoying themselves in and around the IKEA furniture. 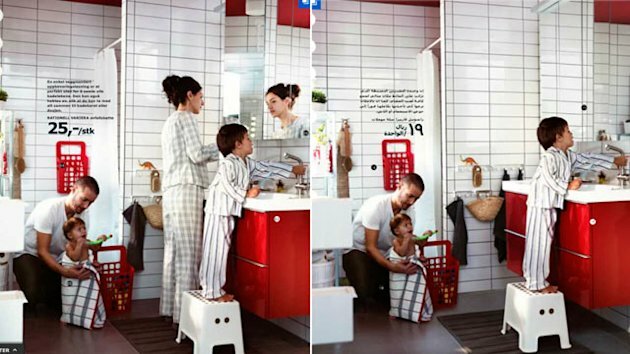 Saudi Arabia’s IKEA catalog does not include women in the scenes. In Saudi Arabia, women cannot drive cars but can vote as of last year. One of the most obvious examples is a page in the IKEA catalog, published in Sweden and disbursed around the world, where there is a women standing beside a young boy in a bathroom. However, in the Saudi Arabian version of the catalog, the young woman has disappeared and the boy is standing alone. “We should have reacted and realized that excluding women from the Saudi Arabian version of the catalog is in conflict with the IKEA Group values,” the company said in a statement this morning. This entry was posted in Feminism and Culture, Sexism in the Media, Sisters In Other Nations. Bookmark the permalink.